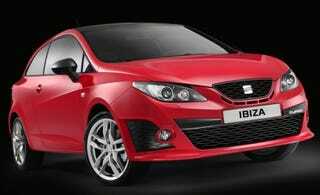 Those wacky Spaniards with the German accents at Seat have released the first images of the 2009 Seat Ibiza CUPRA. The hot hatch has some tasty upgrades over the standard Seat Ibiza: Power comes from a spicy version of the VW 1.4 liter TSI four-cylinder, but here it gets two turbos, forcing output to a heady 180 HP — over 128 HP per liter. That power hits the pavement through a seven-speed DSG transmission driving the front wheels only (for now). Outside, bigger wheels, CUPRA badging, and upside down Auto Union-like vents flanking the grille complete the transformation. Expect full details at the Paris Auto Show unveil in October.